In 2009, Swedish designer Eric Therner took a pen to the iconic light bulb, changing the classic round shape into the distinctive shape of a diamond. Functional and sculptural, Diamond Lights add as much of a decorative element to a space as they do function. It generates a faceted light on whatever object it shines upon. Available in the original clear glass and two new finishes. 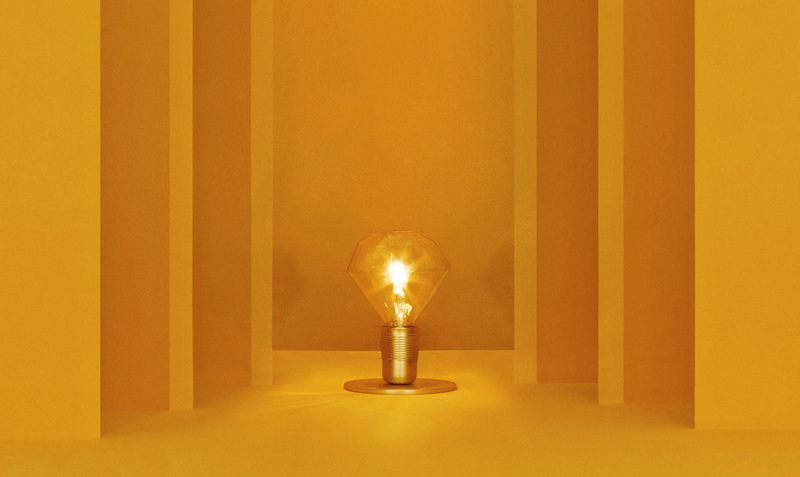 The Diamond Lights has challenged the traditional shape of the lightbulb, changing the idea of what a lightbulb is. You choose the lamp and cord after your own personal taste, making the Diamond Lights easy to fit in different styles of interiors. "I have come to understand that my brain constantly wants to come up with ideas which give the audience that sort of an "aha" moment. A "why didn't I think of that" feeling." In 2009 I suddenly realized that up until that point, lightbulbs had always been round. When I say "always" I literately mean lightbulbs have existed for over 100 years as round objects. The interesting part for me as a designer is that it had been left alone for all those years, it had for some almost mysterious reason been kept just the way it had always been."